WAYLAND — When the actors take their places on stage inside a tiny theater in New York City this weekend, the emotions — instantly fresh again — will wash over Lauren Astley’s mom and dad once more. And the playwright’s lines will sometimes land with a staggering, tectonic force. Lines about grief. Lines about loss. Lines about remorse. And about how to process it all. “There’s a big difference between not wanting to live your life and actually not being able to live your life,’’ another performer will answer. The play is called “The Five Stages,” and Mary Dunne and Malcolm Astley know them all, committing to memory something they wish they could forget. And they know this, too: There’s nothing linear about any of it. As he sat in the living room of his home here, where Lauren Astley had been a bright and robust presence — the child once cast as “Annie’’ in a local production, the beautiful young woman passionate about human rights and social justice — Malcolm Astley knows that, too, as he dissolves into tears. “I never know quite what’s going to set it off,’’ Lauren’s father told me after his sobbing subsided. “When I give my talks, I warn the audience. I say, ‘Stick with me. I’ll get through it OK.’ One of the skills that we need is to be with someone who’s grieving and just witness and not to worry too much about patching up or diving in or rescuing. 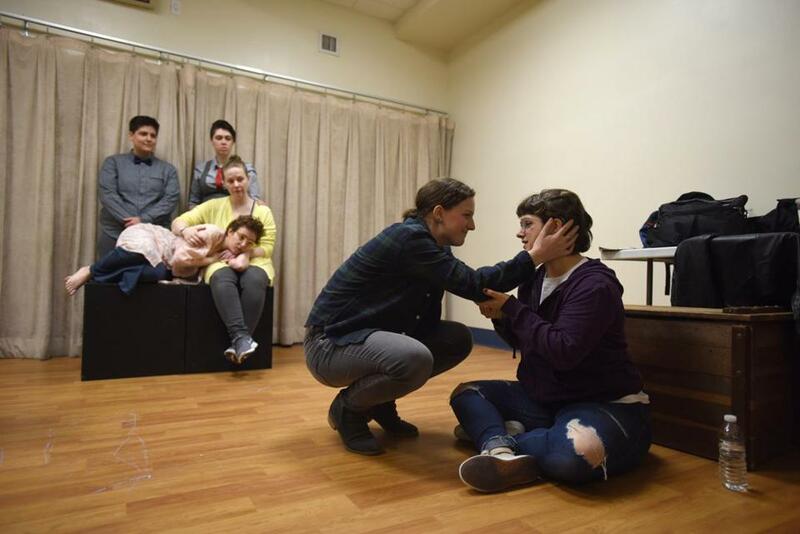 That author is Danielle Barrett, and there is nothing theoretical about her one-act play, which explores the depths of grief and was inspired by Astley’s murder on July 3, 2011, about a month after she graduated from Wayland High School. Barrett grew up here. She and Lauren sang together with the same a cappella group in high school. In that summer of 2011, she was among those to sing at Lauren’s memorial service. “It really shook our whole foundation,’’ Barrett said. The five stages of grief announce themselves on stage, culminating with that elusive final one: acceptance. “Though to be honest, some people never get there,’’ one actor says. “They get stuck in their grief and rage until everything else just fades away,’’ another adds. But the unimaginable grief endured by Lauren Astley’s parents, who had divorced several years before her death, has not obscured everything. They have become high-profile activists on the issue of dating violence. Malcolm Astley, a retired educator, delivers speeches at hearings and conferences. Together, with the initiative of neighbors, they have established the Lauren Dunne Astley Memorial Fund. It aims to promote healthy teen relationships as well as the arts and community service. Malcolm Astley and Mary Dunne. This weekend’s play is part of that commitment, too. Barrett said that even though her play is inspired by the events surrounding Lauren’s death, her name is never spoken in it. She called her play a catharsis, a theatrical work that has simply poured out of her. “One of the things that I’ve been very conscientious about is that I’m not trying to insert myself or manipulate or take advantage of the circumstances,’’ Barrett said. “I’m not claiming to have known her for years and years, or that I was her best friend. Those who have had to confront the five stages of grief know that there is no cookie-cutter way to fully process the loss of a loved one, especially those whose lives are stolen in sudden, violent circumstances. He said he still talks to his daughter. He speaks to her when he’s alone in his car. When he stands alone in his bedroom. He is haunted by her last moments of life. And as he imagines the story that his daughter inspired being brought to life on stage for an 8 p.m. performance Saturday and two performances on Sunday — 2 and 7 p.m. — he is preparing himself for it. “I think there will be a lot of tears,’’ he said. “And there will be incredible hope.